Project Manager for Elmia Garden 2017. Elmia Garden is the trade fair that brings together the entire garden industry in Jönköping every autumn. 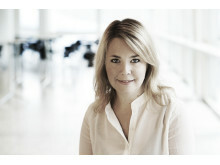 Since the start of this year Kristin Koefoed has taken over from Henrik Landén as manager of the fair. Kristin has worked at Elmia for many years and has been working with Elmia Garden since 2003, partly as the manager of the arena’s experiential and inspirational arrangements. Now presenting the garden trends for 2018! Today we are launching the new online platform Elmia Garden Trends. The website is aimed at everyone who works in the garden industry and can be used as a business tool for inspiration and purchasing support. The Elmia Garden Award for garden product of the year honours new, innovative product solutions that simplify gardening work. It is the Swedish garden industry’s major product prize and the winner often becomes a well-known bestseller. Elmia Garden is northern Europe’s largest meeting place for the garden retail trade. On 4–5 October 160 exhibitors from 10 countries will meet at Elmia in Jönköping to present their new products. Everything from the latest technology to the garden trends for 2018 will be presented on stage. There is a clear trend towards furnishing and decorating outdoor spaces and gardens. In summer the garden and patio are increasingly taking over the role of the living room. Garden furniture, outdoor lighting and food preparation possibilities are all now part of Elmia Garden. Exciting new garden trends, Perennial of the Year for 2018 plus the shortlisted entries for the Elmia Garden Award were some of the elements that attracted great interest at Elmia Garden in Jönköping, Sweden. The trade fair attracted a record number of exhibitors and confirmed its position as northern Europe’s biggest meeting place for the garden retail trade. Elmia Garden Trends is the inspirational website that gives the garden industry a preview of the coming year’s trends. The website functions as a business tool that offers inspiration and purchasing support. Now the trends will also be presented to the general public at Liseberg’s Garden Days from 17-20 May. The list of invasive alien plants is growing – plants whose growth habits enable them to rapidly out-compete other plants and negatively impact biological diversity. Nine new plants have been added to the EU’s list this year, including Himalayan or Indian balsam, giant hogweed and crimson fountaingrass. Several of them are already causing major problems. Can a 3D printer be used in a flower shop? 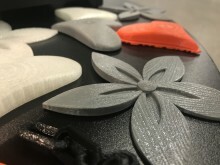 Future Stories, which is about how to get your message out using VR technology, 3D printing and social media, was presented for the first time at Elmia Garden. Christoffer Wadman, a teaching assistant with the engineering programme at Jönköping University, demonstrated how this technology could be used in the future.